A neighborhood association that stretches from some of Uptown’s most placid blocks to some that have suffered through open warfare between criminals and police is now exploring the idea of increasing its police presence with off-duty officers. The Claiborne-University Neighborhood Association held a sort of fact-finding session Thursday night about fee-based security districts, the first in what association president Scott Barron said would be a series of meetings informing residents about the concept. Security districts, used in a number of Uptown neighborhoods, usually levy an additional fee of several hundred dollars onto each property owner’s tax bill within a strictly defined area. That money is then used by a board of neighborhood residents to hire additional patrol officers (either off-duty NOPD officers or a private security team) who patrol only that area, from investigating complaints of suspicious activity to escorting residents to and from their homes at night. In order to be implemented in the Claiborne-University area, the association would first have to vote to request state Rep. Neil Abramson to draft a bill authorizing the district, and then residents inside the district would have to approve it in a special election. Barron said he was still trying to determine if the association even wants to take the first step of requesting a district, and none of the area officials present during the meeting took a strong tone either for or against it. The district would also require city council approval, but Councilwoman Stacy Head said her role would only to be to enact the neighborhood’s decision – not to influence it. 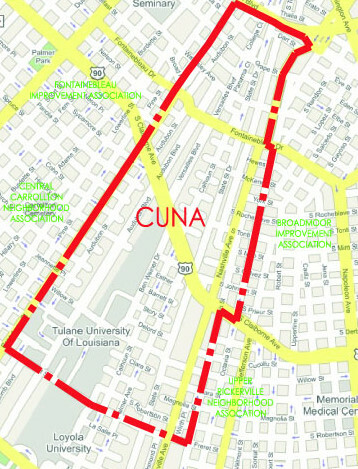 The Claiborne-University area runs essentially from Freret Street all the way up to Earhart Boulevard on both sides of the universities. On a week-to-week basis, the blocks in that area closer to the river report almost no major crimes. The Fontainebleau area, however, saw a string of violent robberies at gunpoint in November, and an NOPD undercover operation intended to catch the robbers ended instead in a shootout between criminals and police. Accordingly, some residents’ chief complaints Thursday night were quality-of-life issues, such as large old houses being chopped into multiple apartments for students who then crowd the streets, sidewalks and even front yards with their cars. Head said the strongest action she can take as a council member is sending a letter to property owners reminding them of the law. Head blamed the lack of enforcement on a city bureaucracy mired in its own habits of inaction, and Enrico Sterling, a staffer for Guidry, said parking used to be enforced through the neighborhoods and should be again. Fontainebleau residents, however, were more concerned with the random violence in their neighborhood, the armed robberies, home burglaries and shootouts. 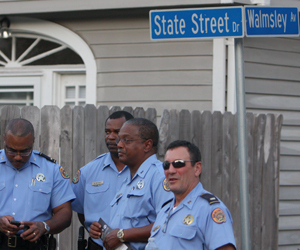 A cadre of quality-of-life officers and detectives from the NOPD Second District were present at the meeting, and residents asked if additional NOPD officers patrolling their blocks would make them safer. “It becomes like walking a beat, almost, where they know the houses, know the area,” Barron added. Not everyone was convinced. Tere Vives, who lives on the edge of the CUNA boundary, said her block was absorbed into the Broadmoor Improvement Association without her knowledge, and she has been frustrated by the additional tax bill. If CUNA decided to create a security district, association members would have to carefully consider its boundaries, Barron replied. For Stan Jahncke, the entire discussion was frustrating, especially in light of the enforcement failures described by the city councilwomen. Aren’t his property taxes, he asked, supposed to pay for that and for police protection? The next quarterly meeting of CUNA will be in April, but Barron said he hopes to schedule a separate meeting for the association to discuss a possible security district with public officials before then.